Can you believe it's already September and another school year has begun!? Well, that means that all of our church plants are in full swing in their various places of service. The news is good... and not so good. For as much as we Americans complain about the loss of our civil liberties, we have not seen legislation outlawing the practice of our faith or the criminalization of proselytizing our neighbors. But such is the case with Pastor Dhan, where he and his family are struggling to bring the Gospel to their native India. Please lift up these brave saints, every day, for the power of God to keep them and to prosper their work, "bringing many sons to glory." Pray Ephesians 4:10-20 over them. 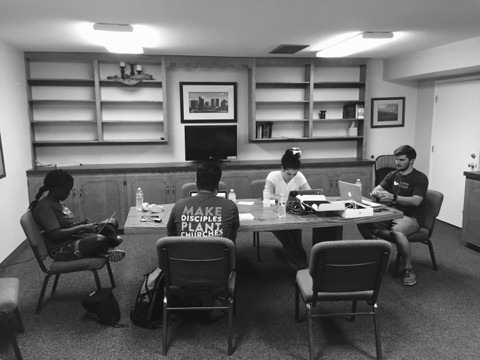 The photo at right is what Bryson Isom calls the War room, at Valley Life/Camelback in Phoenix. They are following up on over 90 people that signed up to get connected with a Community group and or attend the Newcomers Event, at their Fall Kickoff, in August. They prayed and prepared food for between 2-300 students to come. God exceeded their expectations by sending 400+ students throughout the day!!! They are asking for the souls of 100 people to respond to the Gospel and be baptized in the next two years. How is that for a heart to spread the Gospel!? "Now to Him who is able to do exceeding abundant above what we ask or think, be glory!" Bryan wrote, "You are wind in our sails. You are receiving this email because you believe in making disciples and planting churches. "Let's not abandon them to the doldrums of College relativism but pray fervently that "Christ be formed in them", becoming their new desire...indeed, his theme for their first meeting is "Christ is better!" God Bless you, War room staff, and give you the desires of your heart as you boldly proclaim the Truth of God's Eternal Word. They are asking for favor for volunteers who keep full time jobs and still manage many hrs. on campus and for power to thwart the plans of the enemy to undo what they have begun by faith, While progress is slow and no numbers were provided, we can still assume that our God is present and purposeful as these trust Him to send the hungry and also stir up students willing to fill leadership roles. May Abba richly bless their efforts and bring much fruit. It is not uncommon for the enemy to use small children in these young families to distract and detract from mission work. We ask you, Father, as friendships are made and lives changed, that you would wet their young appetites for the sharing of the love of Christ, as they witness the zeal and work of their parents and other brethren. Do not forget brother Matt and family at South Church, Kerrville. Remember to pray for his faithfulness to rightly exposit the Word of Truth and with love and mercy, to continue to shepherd his flock.That he would not lose heart when he is tested and tempted to despair, that he would, with boldness and strength, minister the Gospel to those who have yet to hear the call of Christ, the Good Shepherd. To God alone be the glory for the increase of these varied labors in His vineyard... until He comes. Maranatha!